The Crazy Train has arrived! Working with Little Tikes is one of the highlights of my website. 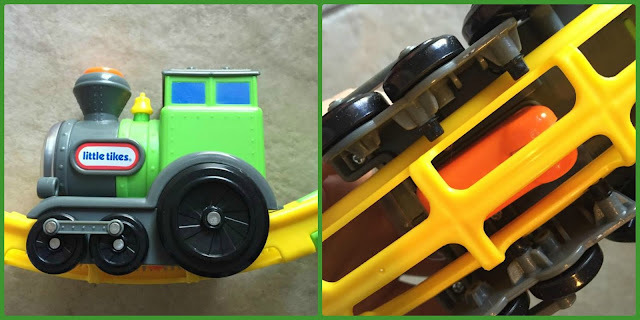 The kids love Little Tikes toys and I love the smile that is on their faces when playing. I have had the pleasure of seeing that smile on Cooper's face while playing with the new Little Tikes Tumble Train. I was a little hesitant when it came to this train as Cooper is 4. I thought, "Would this toy seem too young for him?" "Would Cooper lose interest quickly in the Tumble Train?" Those questions were answered quickly when we saw the commercial on TV and he said "Mom, I want that train!" So, I was lucky enough to work with Little Tikes on testing it out. As you can guess, Cooper has been the best assistant in trying it out! As the mom putting the track together, my fingers hurt just remembering it! It was not the most fun thing I have ever done for my son. However, his smile while watching the Tumble Train made up for it. After the track came apart (for whatever reason -- It stays together rather well) putting it back together wasn't so bad. Maybe Mom needed a little training on how to put the track together first. Once the track is together, the train snaps tightly to keep it going. There are no hard switches for your little guy to slip to start the train. Simply touch the button on top and let it go! I even noticed if it gets flipped over and hits the floor just right, the train will turn itself off. That'll keep your children busy. I can't seem to get Cooper to sit down long enough to take a picture with the train but I was able to get his giggles in the background of a video. 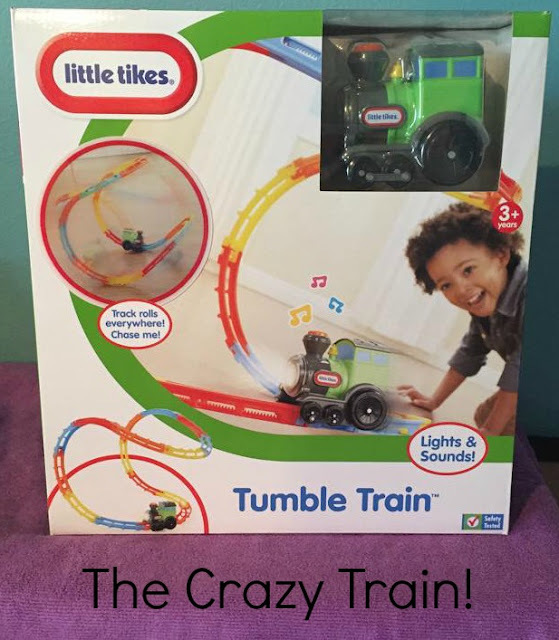 He loves the Tumble Train and I have no doubt this would make a great gift for any little guy or girl this Christmas! You can find the Little Tikes Tumble Train at stores near you or order it online. Either way, let this train find a way under your tree this year. That is such a cute toy for the little ones. My younger nieces and nephews would love it. How much fun is that?! My son would have loved it when he was little! That looks so fun! It might just make a good Xmas gift for a little boy I know. Thanks for the idea! That is such a cool toy! I love that it can go upside down like that. 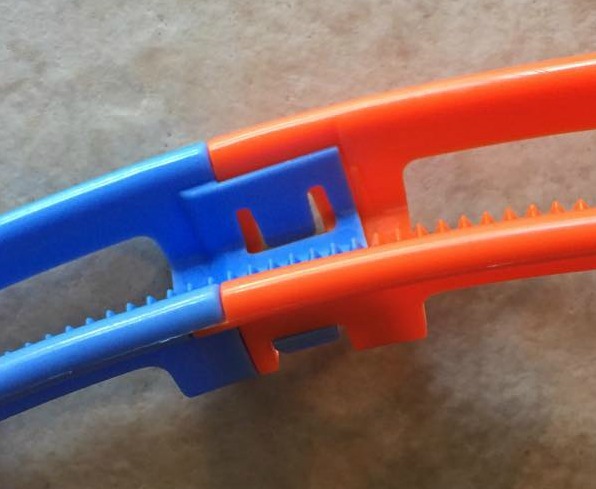 Kids love toys that can do something, "AWESOME!" My daughter would love this! Very entertaining and great for kids of both genders. Oh now this is super cool. It would definitely provide hours of entertainment for the kids. That looks like such a fun toy. I love the Little Tikes brand! Oh, I saw this earlier today for the first time! SO neat! The twins will flip out with this. Little Tiles is a great brand. I have a little nephew that this would make a great gift for. Little Tikes have the best toys around and they last forever. This looks like a ton of fun. I love Little Tikes. This is really cute and great gift idea for a little one. This is super cute! My son would have loved it at this age. Little Tikes is such an amazing brand. This would make for a great Christmas present this year. A cool toy which kids would fall in love easily. I just love that it is different than the normal train toys & kids will be very much excited when the train travels up & down over the curve. Would love to get one for my kids as well. I think my nephew would love this. Thanks for a great Christmas present idea. This looks like so much fun. I wish I had a little one to buy this for.